Be careful what you wish for, my dear. I am always looking for metaphors for Facebook. When I joined some years ago I was quite happy about the whole thing, fascinated with this system of contacting friend’s friend’s friends. That was our honey-moon. Thing are less rosy now. Here is a current metaphor for FB-discussions about sensitive subjects. Or maybe I should say discussing with sensitive, touchy subjects. I haven’t been a soldier, haven’t been in a war. But I DO know what it’s like to walk on a minefield. Talk about gender, migrants, SD or homeopathy on Facebook and…boom. Boooomm! Booomm!!! Imagine that you are mouse. No, not a computer mouse, I mean the small rodent that runs around in the attic at night. 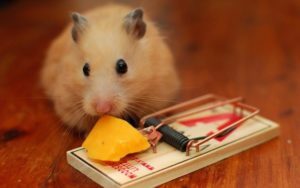 Now imagine that people who don’t like mice have set a trap for you. With yummy Swiss CHEESE! You enjoy the cheese but pay for it dearly, with your life. Maybe you “won” the discussion, but you totally lost the fight energy-wise.